Softcons USA Softcons, based in Florence, South Carolina, is an IT Strategy and IT Implementation Company highly focused in ERP consulting, having over 175 man years of experience. Softcons India Softcons India, a software development center was started in 2010 with an aim of creating a team of world class software developers and ERP experts. By early 2015, the team grew to 30 members specializing in Microsoft .Net technologies, Oracle EBS, Oracle JD Edwards Enterpriseone, Core Java, Android, ios-Xcode and Hybrid Application Development. Founder The bricks of Softcons was laid by Raghu Minasandram, Founder and President, in 2001. He has over 27 years of business experience of which the last 17 years have been in the IT / ERP sector. Raghu S. Minasandram has over 28 years of business experience, with nearly two decades focusing on the IT/ERP sector. He manages ERP Practice at Softcons. Harshil Raj has 10 years of business and functional experience. He currently manages the Indian Operations. Srilatha Embar has over 17 plus years of technical and functional experience in the IT sector of which four years have been in the USA. She specializes in providing client/server and web based solutions in Microsoft Technologies and Oracle Platform. She currently heads the Oracle Team at Softcons, India. Narayana Pai has over 17 years of technical and functional experience in the IT sector. He specializes in providing client/server and web based solutions in Microsoft Technologies and Oracle Database applications. He currently heads the .Net Team at Softcons, India. IT Business Development expert with over 11 years of experience in areas including IT Business Strategy, Client Relationship Building, Inside Sales, High Net Worth Sales, Product Development. Product Marketing and Growth Company Strategy. We have a team of consultants who are highly experienced in ERP and have interacted with stalwarts in the industry. Their experience has been pivotal to our success in providing quality, optimal and innovative solutions. Softcons has a subcontract agreement with CSS, Inc. CSS offers a full range of consulting services, including J.D. Edwards/Oracle EBS ERP applications, Siebel Systems front-end applications, and technical consulting. CSS is a business partner for J.D. Edwards/Oracle EBS and has implemented several J.D. Edwards projects across the United States. Softcons has a long-standing relationship with Vulcraft in Florence, SC. Vulcraft is a Division of Nucor Corp and manufactures Steel Joist and Girders for the construction sector. Raghu Minasandram is actively involved as a senior consultant in all ERP implementations at Nucor for the last 12 years. We have with Nucor on various projects such as the SPS Project which was an Oracle EBS Implementation project for 20 Divisions of Nucor Corp. This project included create custom reports which are not available in OOB Oracle reporting for AR, AP, GL, Inventory and Purchasing modules and generating reports in EiS and OBIEE/BI Publisher, OAF Item Search for creation of customized Item Search form to search across the Oracle database for component items. Contractor Timesheet was another project for custom OAF Application for contractors to create a timesheet to enter the hourly rates for the given piece of work based on work order number and attach it to a particular invoice on receipt. Another was the Asset Mapping application which was designed by us to allow Nucor to assign part numbers to all its assets. The application allows Nucor to identify and track its assets from the asset database to facilitate easy replacement, maintenance and repair. Nucor Steel has a large list of Item catalogs that comprises of equipment parts and machinery. We implemented the Bertha Application which parse these information in two phases – an auto parse which reads through these descriptions by catalog, separates as attributes and assigns them to their respective fields as per the template by searching for pre-set phrases or abbreviations from the template and manual review parse – for further clenching. Final attributes are saved back in the database. Softcons offered consulting services to Sonoco based on its expertise and experience in ERP Consulting Services, Application Design and Development. Sonoco, founded in 1899, is a $2.8 billion manufacturer of industrial and consumer products and provider of packaging services, with approximately 295 operations in 32 countries serving customers in some 85 nations. Yale SOM India Conference website was developed by Softcons, Inc. for the Yale school of Management, South asian forums. 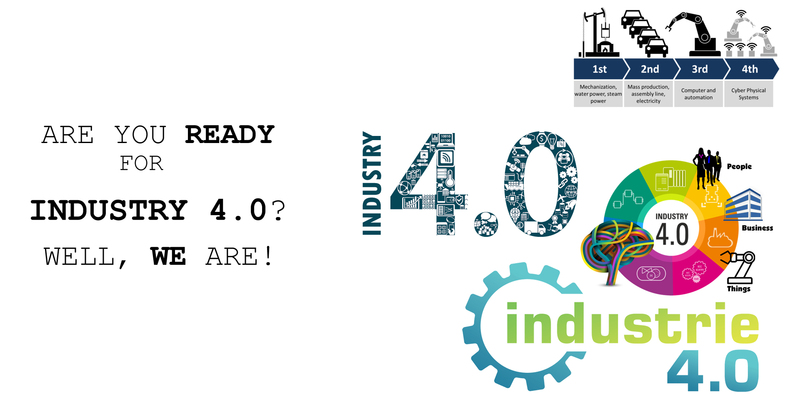 This website was developed for their conference held in April, 2015, which aims at convening thought leaders from India and the US to discuss the business challenges and opportunities that India faces today. We have a Technology Partnership with Airtel. Airtel front-ends with us for Enterprise Mobility projects/solutions like law enforcement, tax collection and similar solutions for Government and Private enterprises. The solutions provided till date are on JAVA, Blackberry and .Net Technologies. Bangalore Traffic Police (BTP), Karnataka State Police Traffic (KSP) and Kerala Motor Vehicle Department (KMVD) are some of the esteemed. customers. Softcons has successfully developed EPCGlobal compliant RFID based IoT solutions for large manufacturing companies in India. The solutions enable real time visibility of material movement across the supply chain, as well as providing enhanced automation capabilities, alerts, reports, and automated documentation for the purpose of transactions as well as compliance. The software is developed by Softcons along with it’s partner company – Arniot Solutions Pvt. Ltd a proven system integration company specializing in RFID and Internet of Things technologies. The solution was based on JAVA, Android, Groovy and .Net Technologies. Tenr is a young team, based in Bangalore who service global clients for Enterprise solutions and Analytics. They target global heavy industry with custom-built solutions for entire business management. Softcons worked on responsive UI frameworks for their process oriented enterprise product named ‘Field Management System’ in HTML5, Bootstrap frameworks and responsive layouts in .NET MVC. Softcons is the approved vendor for Kaylea Consulting for managed services. 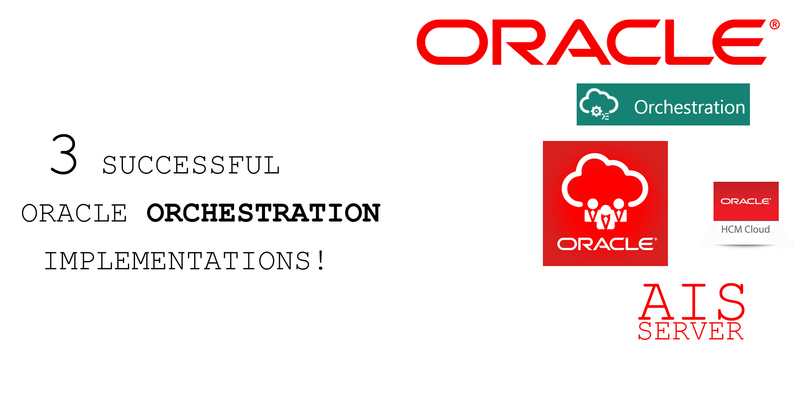 Softcons is currently building a product with iAM HCM using Orchestrations for HCM Module. This product includes functionalities like service requests, data requests and rules required for building orchestrations for Employee Entry, Dependent Entry, Dependent Enrollment, Status Change, Employee Self Service – Time Entry (Daily Time Entry and Summary Time Entry) and Address Change. Softcons has worked on various projects with iAM HCM, such as,Crystal sugar – Blue Cross Blue Shield Enrollment. This project included development of custom report for creating a ANSI 834 Enrollment feed to be sent to the health care provider BCBS (Blue Cross Blue Shield) based on the current enrollments of Employees and Dependents. Another noteworthy project being, Worker Loader, which included development of custom reports for extracting the text attachments and other media object attachments from the Employees, Employee Wage Attachments and the Employee Supplemental data in the JDE environment and creation of batches for upload into Work Day application. We have also worked with iAM HCM on the Pinal county Project which included Employee Self Service/Benefit Self Service for Development of custom report for Open Enrollment and Update Personal Information including creation of new dependents based on the feed from American Fidelity portal. Spectrum Consultants is a leading energy management and solution company head quartered in Bangalore. Softcons has successfully developed a IT product for Spectrum which is used for Sub Station asset management and asset maintenance for their customer, a noteworthy Government Electricity Supply Company. 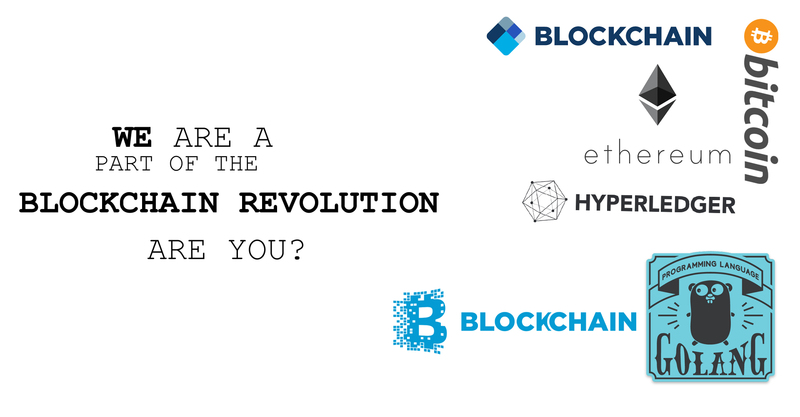 The product is very robust and scalable. It was developed using technologies like ASP.net Web API, AngularJS, HTML5 and SQL Server 2014. Vulcraft has adopted our product SMARTFLEET, which is a web-based application for fleet management and automated quarterly filing of IFTA Returns. For more information please visit www.smart-fleet.com. Softcons has developed a application for Nucor Yamato to handle their complete steel mill rolling plant.We also worked on their PLC which monitors their entire manufacturing process.The legacy system code was converted from VB to C#,.NET. Softcons has provided IT/ERP services to Velocity Technology Solutions for many of their clients like Atkins, Brown and Root, Rehrig Pacific Company, Ridge Tools for both assistance on functional tasks and technical development of applications and reports. We have also done AIS and Orchestration Projects for velocity clients which included development of AIS Form Service calls through JSON to create, update and retrieve sales order, to create electronic receipt processing, passing the mandatory fields and other fields through JSON inputs. Orchestrations for Customer master for Rehrig. Langoor and Softcons have entered into multiple partnership programs where Softcons plays the Software Development role. One such project was CHEP, which was developed in Microsoft ASP.NET 4.0 and backend being Microsoft SQL Server 2008 R2 on Microsoft Azure. Other programs include XCode (ios) development and Hibernate Framework Technology. Softcons, being the sole software vendor for AutoAllot, wrote the entire AutoAllot application from scratch keeping in mind flexibility, adaptability and scalability. This was the first e-commerce platform created end to end by Softcons. The application was written in new cutting edge Java Scripting techniques and .Net Web API calls. The development time was reduced in half by using rapid application development methodologies.The live product is fully developed, hosted and maintained by Softcons. Mobveus is the world’s first e-commerce store for IT Solutions having a patented (USA) tool to assess IT Requirements of a business entity. Softcons is an official registered vendor for Mobveus for IT Services. Projects include Meeturite, MightyAds, CakeMart, Anjanadri Printers etc. Softcons is the official IT partner to Spectrum Consultants. The Business Partnership has been flourishing since 2016. The partnership has seen numerous fruitful deployments of Enterprise Mobility Solutions, IT Services and Product customizations over the last 2 years. Indian Payroll is one of the complicated activities in business environment. WalletHR helps to automate the payroll process to help the companies to comply with the statutory requirements and to generate timely and accurate reports pertaining to payroll and HR thereby enabling better utilization of manpower resources. 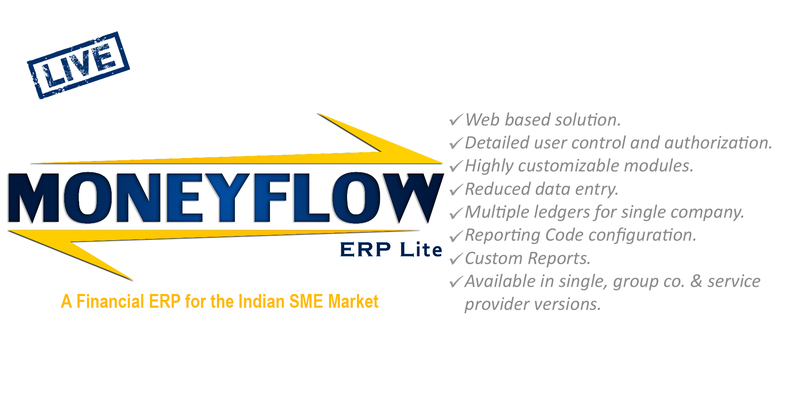 Financial ERP for the Indian market MoneyFlow is a one stop accounting and financial software for all small and medium size enterprises. Its objective is oriented towards minimizing data redundancy and centralization of the entire accounting and financial system. It focuses on user friendly principles allowing faster data entry. It is a very simple but highly effective system of accounting and financial management which provides solutions from the point of sale till the point of the Income Tax Return. Detailed user control and authorization. Multiple ledgers for single company. Available in Group co. & service provider versions. Fuel Tax Compliance software for the US Market. (Successfully implemented at Nucor Vulcraft). Visit www.smart-fleet.com for further information. SmartFleet utilizes the latest technologies to provide comprehensive fleet management capabilities for all sizes of fleet operations using Internet or Intranet platform. Quarterly IFTA filing is a time consuming job for owner operators and small trucking companies. SmartFleet is a new trucking software that automates everything in a flash of a time. Fully compliant with Fuel Tax regulations. 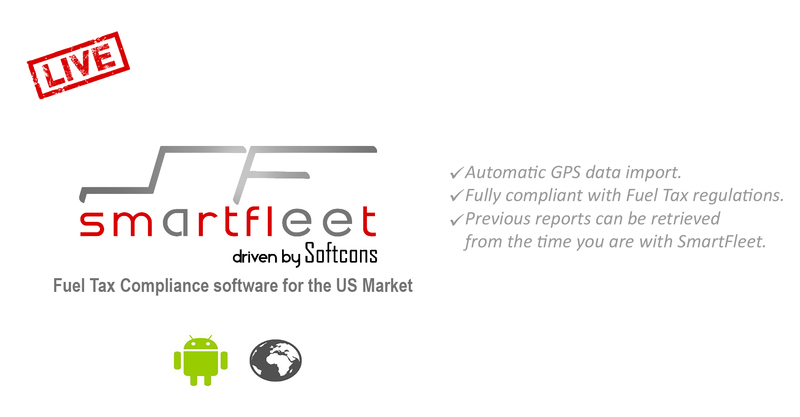 Previous reports can be retrieved from the time you are with SmartFleet. 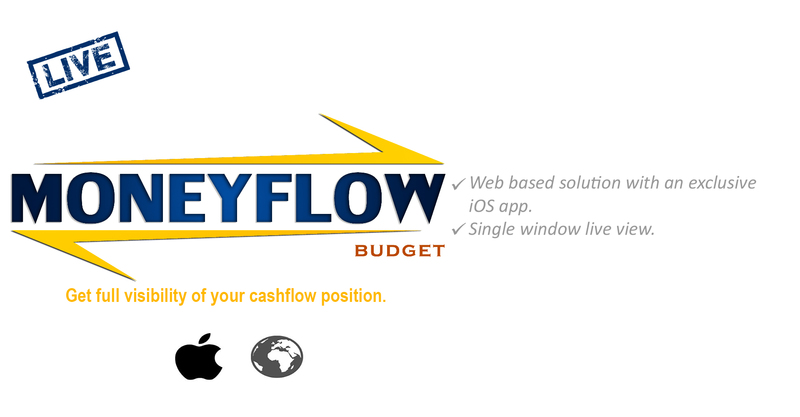 Full visibility of your cash flow position. Whether you are an individual or a business entity, MF Budget gives you full control of your cash flow planning. With multiple bank accounts and parallel cash transactions, you might end up in a mess and lose track of your money in and money out! MF Budget brings all your transactions in one place, organizes them and shows them to you in a calendar format so that you never lose track. Web based solution with an exclusive iOS app. World’s simplest Asset Tracking Solution! 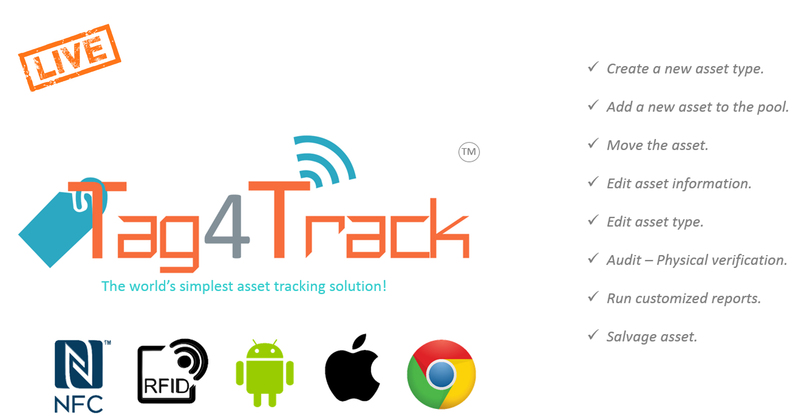 Tag4Track is an NFC/RFID based Asset Tracking Solution.Role based authentication.Option to customize the authorization levels. Create custom asset type with detailed custom parameters. Create/update asset with web or a smartphone. Tag the asset during the creation of the asset from a smartphone.Track movement of asset from web or a smartphone. Access detailed asset history. Run custom reports to track and trace assets.Dashboard & Asset list based on real time status. Automated audit checks. Salvage asset. NFC-V and RFID (bulk scan) based Hybrid technology which combines power and strength of both technologies. NFC enabled phone can read tags attached to an asset, so end users can use their NFC enabled smartphones for transactions. Compatible with non NFC based phones using smart search. "Bring your own device" concept will help the organization implement the cost effective. Cloud based application will support seamless integration of multiple-location/centralized asset tracking. Employee performance appraisal and feedback system. 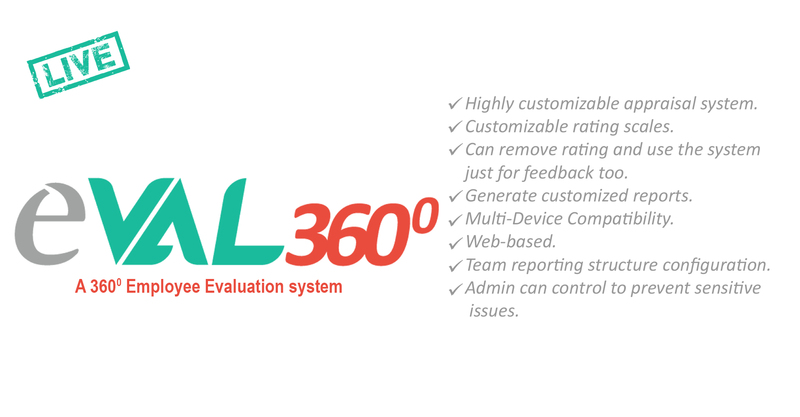 eVAL360° application is a 360 degree collaborative performance appraisal system. The default template is based on attendance, productivity/use of time, teamwork & collaboration, communication, quality & accountability, adaptability, initiative & problem solving, performance management & leadership. A new template can be added or the default template can be altered to suit the needs of your organization. A final score is generated based on the scale chosen during the set up. Can remove rating and use the system just for feedback too. Admin can control to prevent sensitive issues. A resource and project mapping and management application. 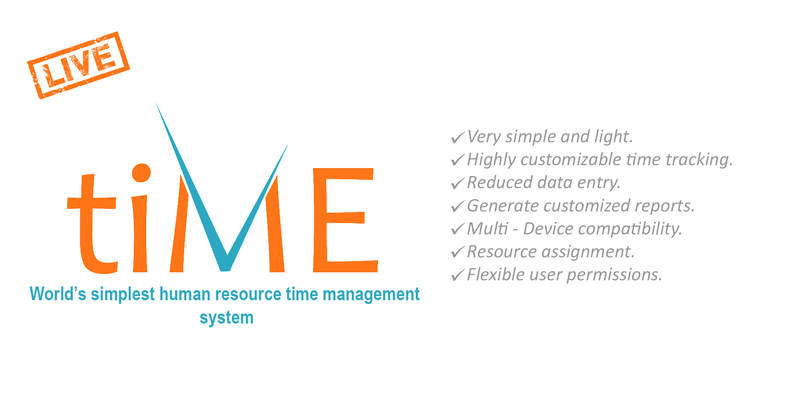 The tiME (Time-Me) application helps you track weekly estimate vs. actual hours logged by each resource in the team. The tracking is multi-dimensional i.e. client-wise, project-wise, resource-wise, billability-wise or a combination of these. The variance report which shows the gap between estimates and actuals help making better estimate decisions for the following week. With the work environment becoming more agile day by day, this weekly review will realign the team towards the goal. Job Description: Under supervision of Team Lead/Project Manager, assist with development, creation, and modification of computer/ERP applications and interfaces using Informatica, including C, C++, SQL/Oracle Server queries; analysis of industrial mfg. and systems (management and administration) for designing, configuring and maintaining integrated ERP systems using J.D. Edwards/Oracle E-Business Suite (EBS) with the aim of optimizing operational efficiency. Requirements: Bachelor’s in Computer Science, Information Technology or Electronics Engineering. 1 year experience as Systems Analyst, Programmer Analyst, Software Engineer or any suitable combination of experience/education/training. COPYRIGHT 2015 - SOFTCONS, INC.; All rights reserved.